Candied orange slices make great edible gifts and it is perfect to add to this ORANGE RING CAKE WITH GLAZED ORANGE SLICES! Add teaspoonful hot milk to icing sugar until a thick consistency. Can serve without icing too. Cut 1 Orange in slices. Boil one cup sugar and half cup water on the stove. Add orange slices and cook slowly until you get the glaze effect. Drip dry on rack and use as garnish on orange cake. 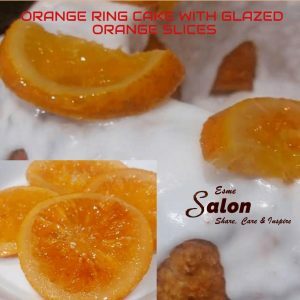 A delicious sounding orange cake recipe.